Jean-Baptiste-Camille Corot (1796–1875), The fisherman: evening effect (c 1865-70), oil on canvas, 27.7 x 41.4 cm, Art Gallery of South Australia, Adelaide. Wikimedia Commons. Corot was a central figure in the development of painting in the nineteenth century. He learned the tradition which had originated with Claude Lorraine and Nicolas Poussin, and was augmented by the development of plein air oil sketching in the eighteenth century. As he was becoming established, Constable’s landscapes were making a great impression in France, and undoubtedly influenced him. Among his pupils were two of the ‘core’ Impressionists, and he is thus the strongest and most direct link between ‘modern’ landscape painting and its pioneers. He painted trees in the landscape throughout the fifty years of his career, from the hot and arid views around Rome, and in the Forest of Fontainebleau, to his later ‘souvenirs’ with their characteristic style. If anyone knew how to paint trees, it was Corot. (Jean-Baptiste-)Camille Corot (1796-1875) was born and brought up in a bourgeouis family living in Paris. Showing no signs of any particular talent at school, he was apprenticed to a draper, and worked in the trade until he was 26. He started painting landscapes, and when he was receiving a comfortable annual allowance from his parents, in 1822, set up his studio on the Quai Voltaire in Paris. He studied under Michallon, who continued the tradition of plein air oil sketching and grand finished landscapes of Pierre-Henri de Valenciennes, but this was cut short by Michallon’s death the same year. Corot then studied under Michallon’s teacher, Bertin. 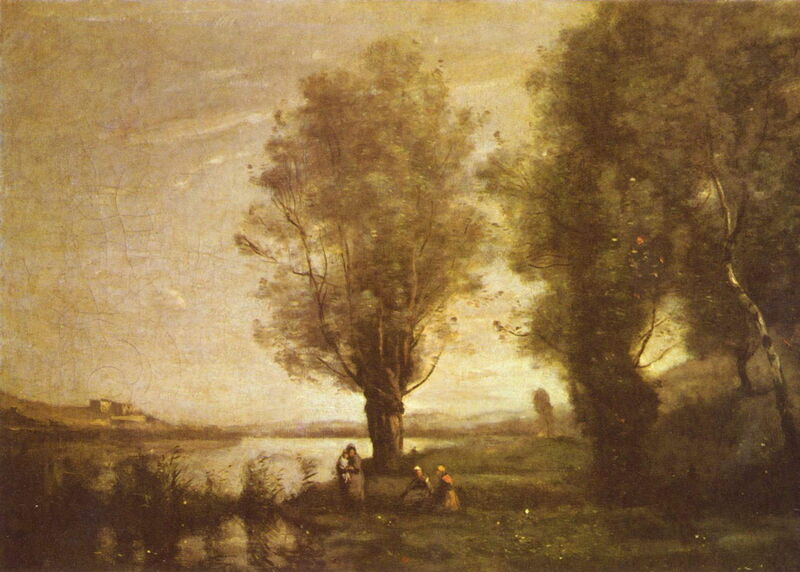 Corot spent the years from 1825-8 painting ferociously in the Roman Campagna, where his technique developed very rapidly. Among his most accomplished paintings in that period is View of Rome: The Bridge and Castel Sant’Angelo with the Cupola of St. Peter’s (1826-7), discussed in detail here. His subsequent studio work concentrated on preparing finished landscapes for the Salon, but from 1829 he started to paint plein air around the town of Barbizon and the Forest of Fontainebleau, to the south-east of Paris. There he met Théodore Rousseau, Constant Troyon, Millet, Daubigny, and Paul Huet, forming the Barbizon School, an important precursor to early Impressionism. His critical reception was uneven, and he had many paintings rejected by the Salon jury. However Baudelaire took up his cause, and he achieved recognition in the late 1840s, joining the jury in 1848. He assumed a more senior role, and taught Camille Pissarro, Berthe Morisot, and many others who were to achieve later fame. Corot’s early Ville-d’Avray: Entrance to the Wood (c 1825) must have been painted just before he departed for Italy, and shows the classical influences gained during his training. Over what was probably a series of plein air sessions, the foliage in the foreground is finely detailed, and the dominant tree in the middle of the painting has been worked anatomically, its foliage laid carefully onto a structured framework of branches. This is not dissimilar to the approach used by Constable, or the tradition stretching back from Michallon. Jean-Baptiste-Camille Corot (1796–1875), Castel Gandolfo (c 1826), oil on canvas, 36.3 x 28.3 cm, Museum of Fine Arts, Budapest. Wikimedia Commons. Once painting around Rome, his composition became less orthodox. 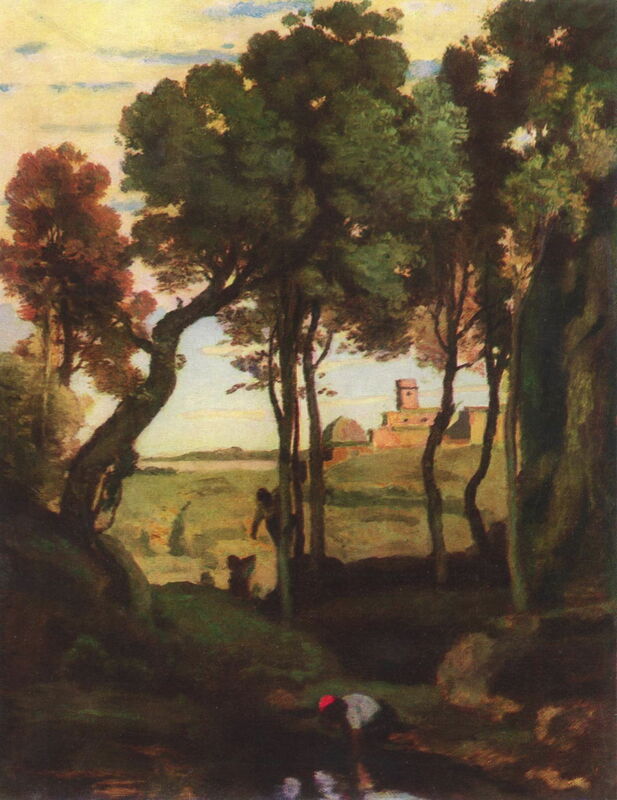 In Castel Gandolfo (c 1826), the trees form an exaggerated repoussoir for the distant castle, and figures in the foreground suggest the embedded mini-narratives typical of Poussin, perhaps. Probably painted in a single plein air session, the trees remain anatomical in structure, but their foliage is painted more en masse. This was typical of his oil sketches during his first sojourn in Italy. Jean-Baptiste-Camille Corot (1796–1875), Fontainebleau Forest (The Oak) (c 1830), oil on canvas, 48 x 59 cm, Private collection. Wikimedia Commons. When he returned to France and joined the Barbizon School, trees became of greater importance in his paintings again. In Fontainebleau Forest (The Oak) (c 1830), the twisted limbs of the oak have taken more time and care, sufficient to give some texture and shadows to the trunks and branches. Where the canopy is more broken, Corot has painted in considerable detail in the leaves too. Jean-Baptiste-Camille Corot (1796–1875), Honfleur: Calvary (c 1830), oil on panel, 29.8 x 41 cm, Metropolitan Museum of Art, New York, NY. Wikimedia Commons. Honfleur: Calvary (c 1830) was painted just outside the town of Honfleur, on the southern bank of the Seine where it reaches the sea, south of Le Havre. Corot here starts to make gestural marks more, particularly in the bark and foliage of this small grove of trees. Their canopies are less anatomical in construction, and are made up of a wide variety of marks, imparting an unusual texture. Where the foliage is sparse, as on the tree closest on the right, Corot marks out individual leaves, though. The figures are also painted very gesturally, in a manner which would be considered more typical of some of the pre-Impressionist paintings from northern France, twenty or more years later. Jean-Baptiste-Camille Corot (1796–1875), Young Man in front of a Great Oak (1840-2), graphite heightened with white gouache on tan paper, 29.2 x 39.8 cm, Museum of Fine Arts, Houston, TX. Wikimedia Commons. Although his oil sketches were often quite loose, Young Man in front of a Great Oak (1840-2) is more typical of the highly detailed graphite sketches which Corot made of trees, in the Fontainebleau Forest and elsewhere. 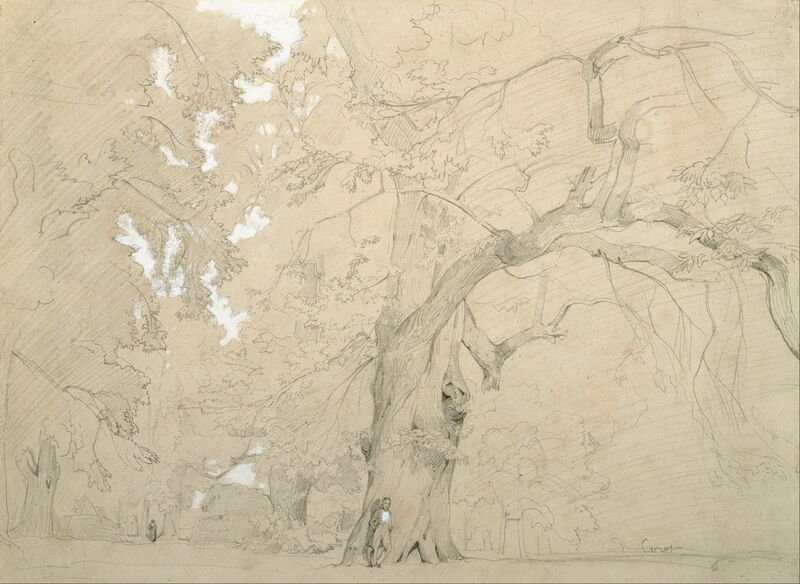 He captures the form and texture of the trunk of this oak with a remarkable economy of line. Although the forest canopy is blocked in more en masse, he still shows its anatomical structure. Jean-Baptiste-Camille Corot (1796–1875), The Toutain Farm, Honfleur (c 1845), oil on canvas, 44.4 × 63.8 cm, Bridgestone Museum of Art, Tokyo. Wikimedia Commons. 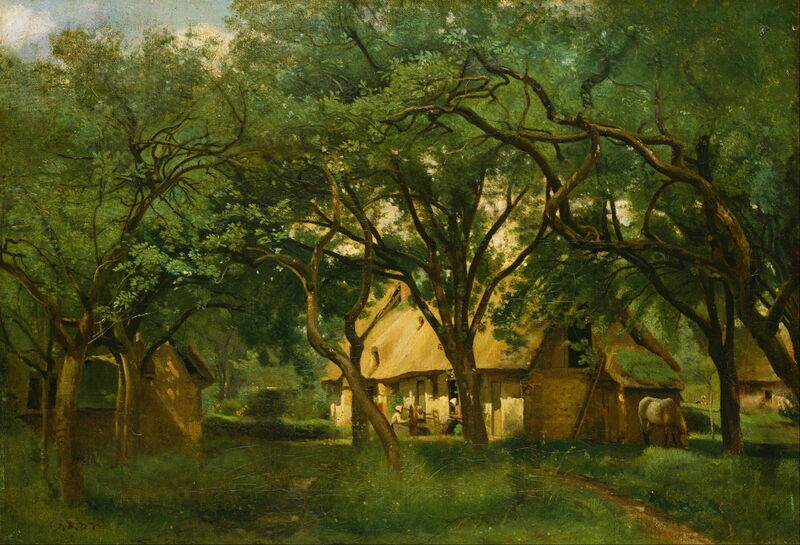 The Toutain Farm, Honfleur (c 1845) is a remarkable contrast to Corot’s far more painterly Honfleur: Calvary of fifteen years earlier, but appears to be a finished studio painting, perhaps intended for the Salon. Its trees are marvellous and all but obscure and upstage the farmhouse beyond, in a composition reminiscent of Castel Gandolfo (c 1826) above. Studying the sinuous limbs of those trees shows the much more structured approach to painting their canopies here, and a catalogue of different ways in which the trunk can give rise to branches. The canopy itself is shown in more detail, although at the upper left it seems more vague and sketchy, almost unfinished. Jean-Baptiste-Camille Corot (1796–1875), Morning, Dance of the Nymphs (after 1850), oil on canvas, dimensions not known, Private collection. Wikimedia Commons. 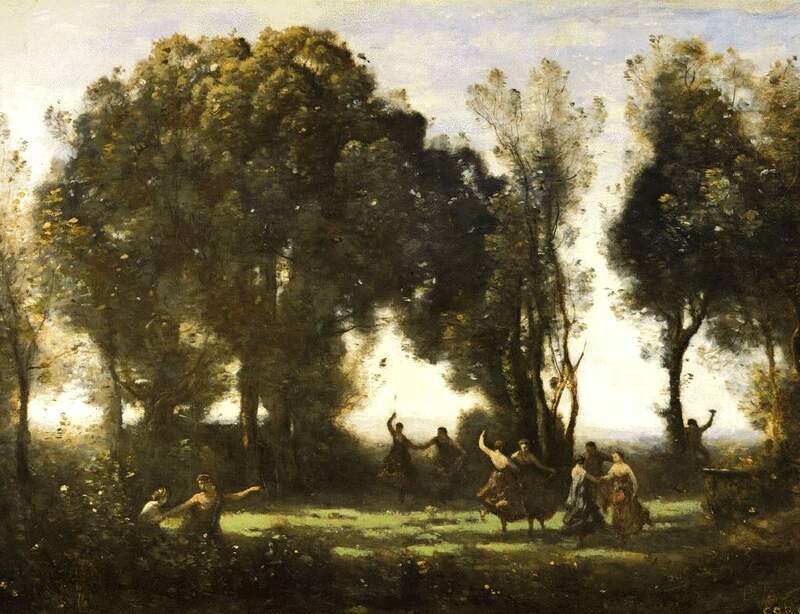 Later in his career, Corot was drawn more to using trees and landscape in mythological settings, as in Morning, Dance of the Nymphs (after 1850). In these, the figures were usually painted fairly classically, but the trees are formed from a rich variety of marks. These include the more solid masses of the canopy of the large tree in the middle, and various strokes, dabs, and finer marks in those closer. These are characteristic of Corot’s trees from about 1850 onwards. Jean-Baptiste-Camille Corot (1796–1875), Wooded Landscape with Cows in a Clearing (c 1855), oil on canvas, 41.9 × 29.8 cm, Los Angeles County Museum of Art, Los Angeles, CA. Courtesy of Los Angeles County Museum of Art, via Wikimedia Commons. 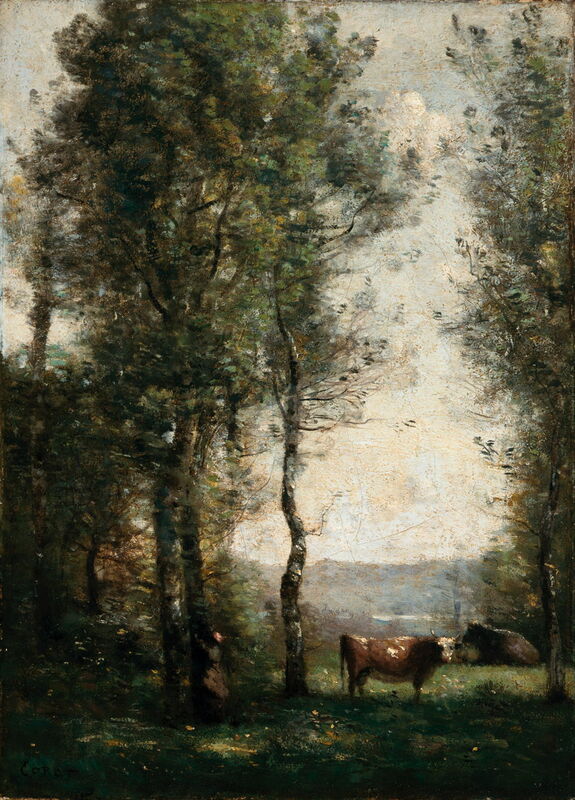 In Wooded Landscape with Cows in a Clearing (c 1855), Corot returns to more gestural marks, most obvious in the bright patches on the cows and trunks of the trees. 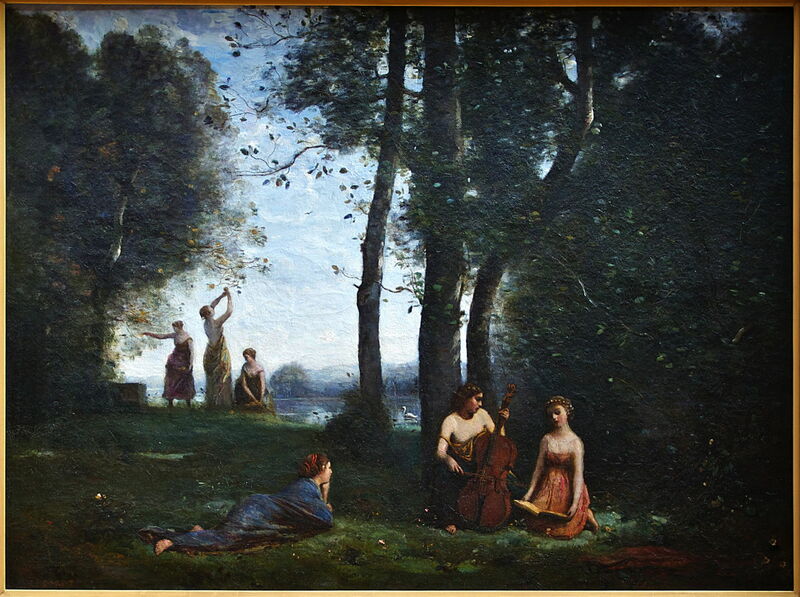 Jean-Baptiste-Camille Corot (1796–1875), Le Concert Champêtre (Woodland Musicians) (1857), oil on canvas, 130 x 98 cm, Musée Condé, Chantilly, France. Wikimedia Commons. Le Concert Champêtre (1857) is one of the most beautiful of Corot’s ‘mythological’ settings, with carefully finished figures clad in colourful robes, and assuming statuesque poses. Yet Corot’s trees appear dark and almost threatening. Their construction adheres to his late style, although foreground twigs and leaves are more formally expressed. 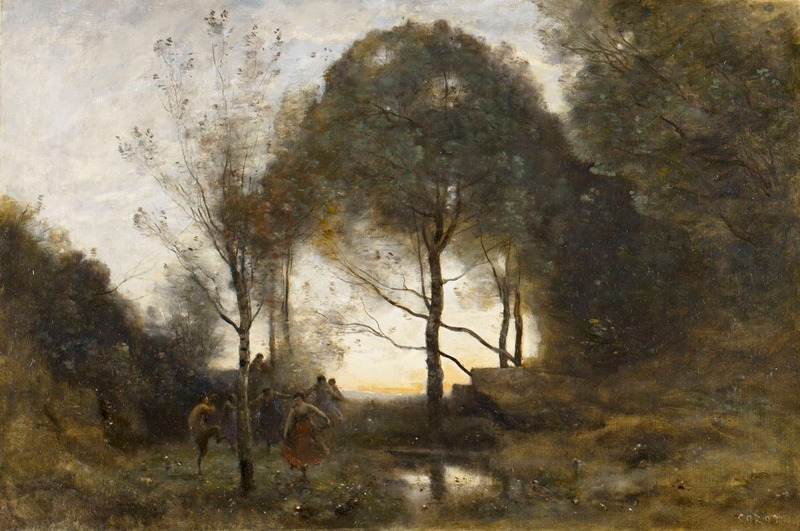 Jean-Baptiste-Camille Corot (1796–1875), Souvenir de Mortefontaine (1864), oil on canvas, 65 x 89 cm, Musée du Louvre, Paris. Wikimedia Commons. Towards the end of his career, Corot painted many ‘souvenirs’ which remain controversial today. Lacking the originality of his earlier work, and their fresh colours, some see them as atypical and inferior to his earlier work. Souvenir de Mortefontaine (1864) is one of the more famous, and exemplifies his late style for trees. They have clear underlying anatomical structure, with a wide range of marks to indicate foliage. Jean-Baptiste-Camille Corot (1796–1875), Morning, or Cathedral of Mantes, with a Fisherman (c 1865), oil on panel, 52.1 x 32.6 cm, Museum of Fine Arts, Rheims, France. Wikimedia Commons. It would be wrong, though, to accuse Corot of just pumping out souvenirs over his latter years. Morning, or Cathedral of Mantes, with a Fisherman (c 1865) is altogether more colourful, and experiments further with composition. The trees here do not frame the distant subject, but dissect it. 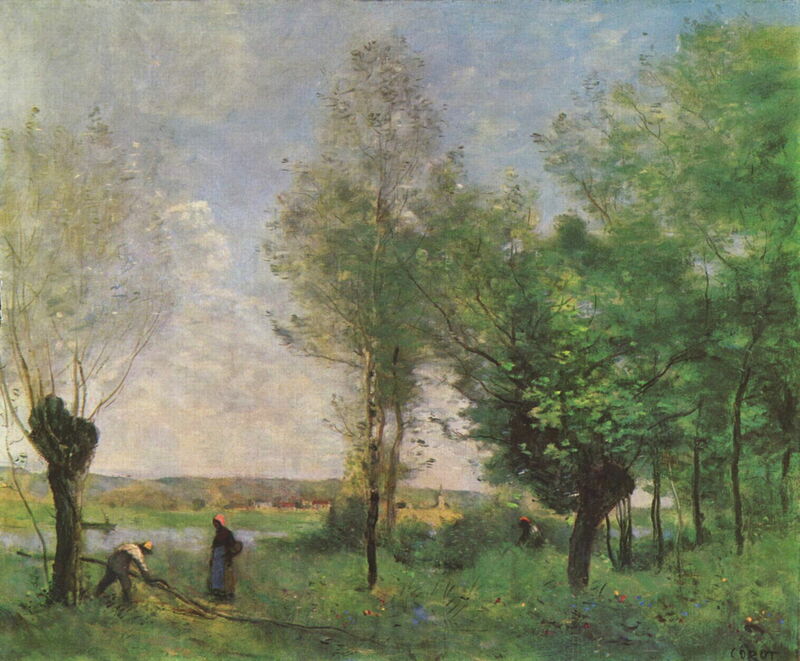 Their foliage continues to follow Corot’s late style, with a wide range of marks, although more individual leaves have been painted here. The fisherman: evening effect (c 1865-70) is an unusual combination of early Impressionism and Corot’s late style of trees. It appears to have been painted very quickly, with rough daubs of clouds, and depicts the effects of transient light at dusk. The trees consist of loose compositions of coarse and fine brushstrokes, some anatomical structure, and various dabs and spots. Jean-Baptiste-Camille Corot (1796–1875), Rest under the Willows (1865-70), oil on canvas, 43.5 × 60.5 cm, Musée des Ursulines, Mâcon, France. Wikimedia Commons. 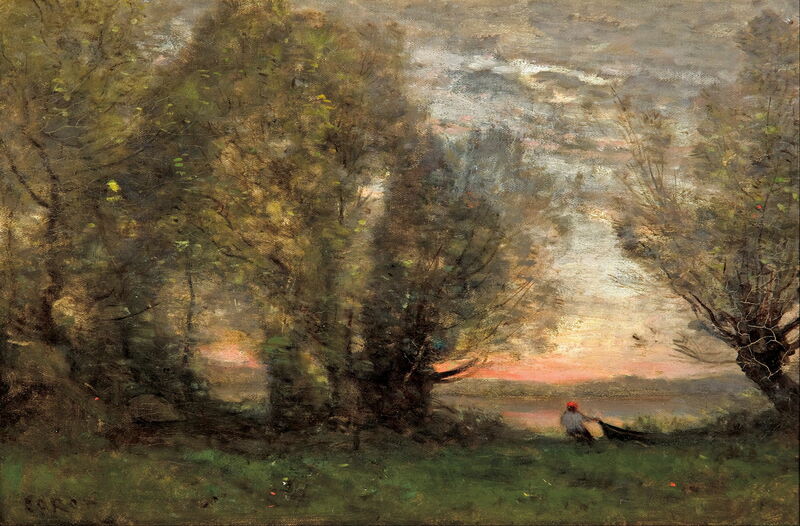 Rest under the Willows (1865-70) is more typical of Corot’s souvenirs, its forlorn figures taken perhaps from Millet. Painted in his late style, the trees dominate the motif, and show rich variation. Jean-Baptiste-Camille Corot (1796–1875), Nymphs and Fauns (before 1870), oil on canvas, 54 x 90.2 cm, Birmingham Museum of Art, Birmingham, UK. Photo by Sean Pathasema, via Wikimedia Commons. Nymphs and Fauns (before 1870) returns to a mythological theme, the nymphs and fauns dancing around low birch trees, behind which a more mature birch fills the centre of the painting. Jean-Baptiste-Camille Corot (1796–1875), Souvenir de Coubron (1872), oil on canvas, 46 x 55.3 cm, Museum of Fine Arts, Budapest. Wikimedia Commons. 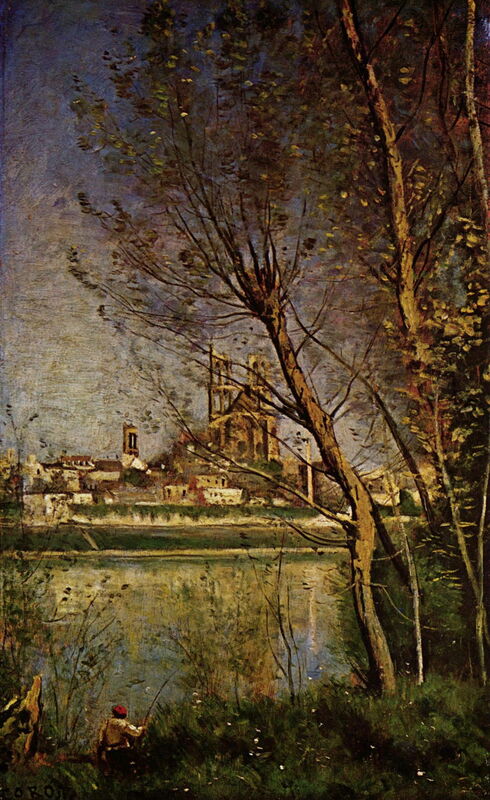 Souvenir de Coubron (1872) is one of Corot’s last but finest souvenirs, with a distinctly early Impressionist look. Unlike most of his other souvenirs, its colours are more saturated and varied, with hats and flowers in bright reds and yellows, and rich greens throughout its lush vegetation. 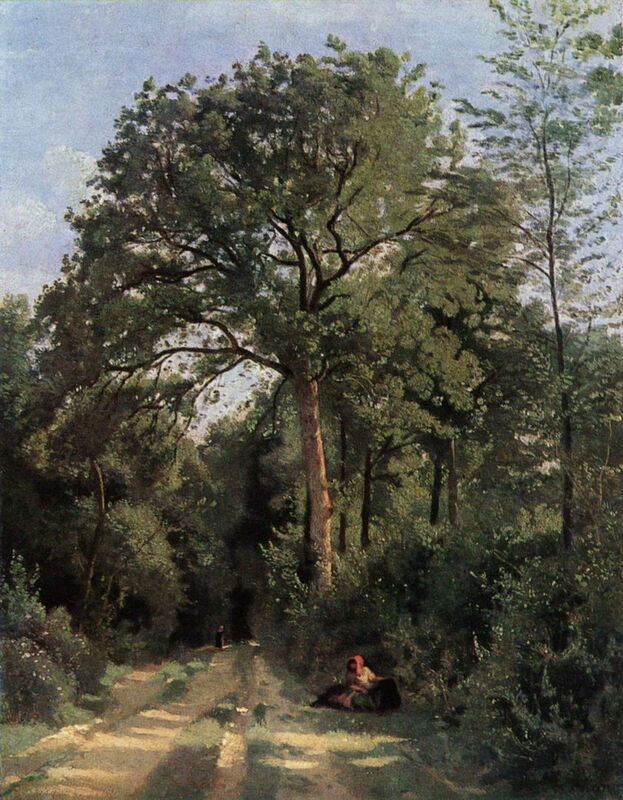 Although its trees are more uniform than in some of his earlier works, a couple appear to be pollards (unusual for Corot), and each has its foliage constructed from a wide range of marks. 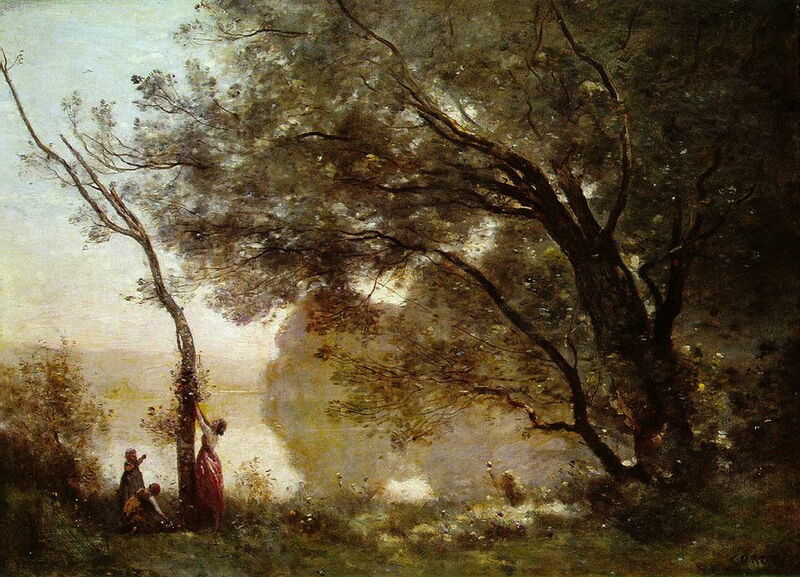 During his long career, Corot probably painted more trees than any other artist. 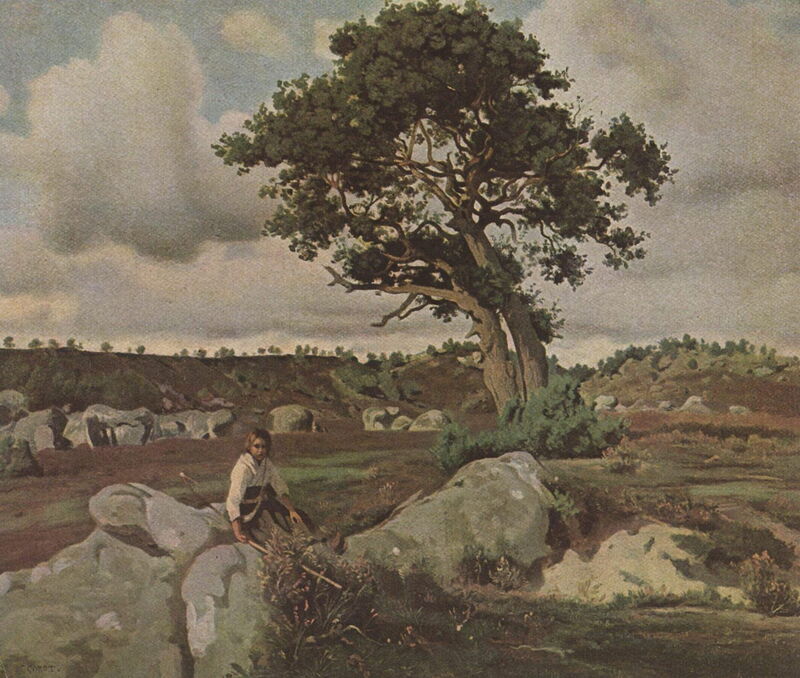 The evolution of his style is reflected in the manner in which he constructed and depicted those trees. In his early paintings, they reflected the classical method, based on the anatomy of the trunk and branches, with foliage which varied from en masse to the painting of individual leaves. As early as 1830, he started to paint trees using more gestural marks, anticipating some of the changes which were about to happen with the advent of more painterly styles and Impressionism. Later in his career, from about 1850, his trees assumed a characteristic style in which their foliage consisted of a very wide range of marks, including broad and fine brushstrokes, dots, dabs, and daubs. Canopies had an ill-defined haziness rather than solid structure, and finer marks suggested the detail of individual leaves. 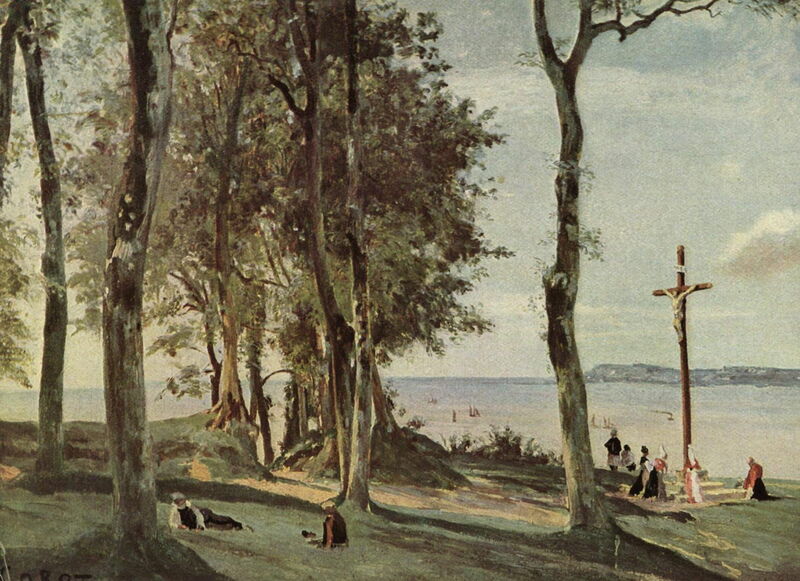 Although he taught Pissarro, who in turn mentored Cézanne, Corot’s late style was not adopted by either of them, but its use of marks was clearly influential on both, and many others in late nineteenth century painting. If Constable acted as a bridge, Corot was the crossroad leading to ‘modern’ art. Jones K et al. (2008) In the Forest of Fontainebleau. Painters and Photographers from Corot to Monet, Yale UP. ISBN 978 0 300 138979. Posted in General, Painting and tagged Barbizon, Corot, Impressionism, landscape, Michallon, Morisot, painting, Pissarro, plein air, trees, Valenciennes. Bookmark the permalink.